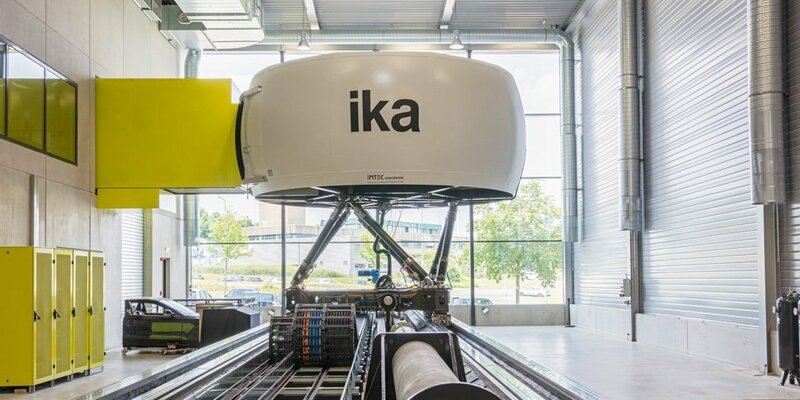 The highly dynamic driving simulator at the Institute for Motor Vehicles (ika) at RWTH Aachen University went into operation in October 2016. The business unit VISCOM of Fraunhofer FOKUS has developed the projection software of this simulator. A slight jerking of the seat accompanies our trip over the motorway. On the left lane a truck overtakes. Our car is equipped with automatic cruise control that keeps us at a safe distance from the vehicle in front. Suddenly red brake lights light up and our car brakes automatically. We are pressed into the seat belt and feel our pulse accelerate. We are familiar with such situations from everyday road traffic. Now they can also be reproduced and experienced in the driving simulator at RWTH Aachen University. 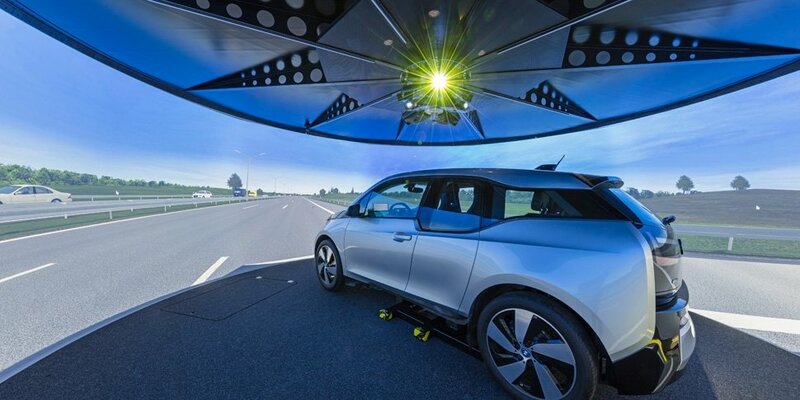 The simulator is used for vehicle development, especially in the field of autonomous driving. The projection technology used in the simulator ensures that users have a real life like experience. Images from eight WUXGA projectors (Barco F22) are assembled into a 360° image on a spherical screen. This is done by the projection software developed by Fraunhofer FOKUS: With the help of warping, blending, and projector autoalignment each projector's image is adjusted to fit together without a visible transition to create a seamless image. The technology is required because of the shape of the screen - in this case a spherical surface with a diameter of seven meters - would lead to distortion in the projected images. The driver's cabin including the projectors and the screen is mounted on a motion system which is mounted on a 28-metre long rail system with a usable length of 12 metres (travel). The entire unit is more than eight meters high. The simulator allows highly dynamic movements in all degrees of freedom. If a projector is distorted by the movements of the simulator, resulting in projection artifacts or blurring in the projection, the entire system (projectors and the calibration camera) can recalibrate fully automatically, resulting in a seamless overall image. For this purpose, the rotatable camera mounted centrally in the simulator records the individual projection images. These are then calibrated by the software developed by Fraunhofer FOKUS in a so-called warping box (Barco WB 1920) and adapted to a seamless overall image. The software then performs the necessary calibration of the projectors. The technology used in the driving simulator is already being used for 360° cinemas, e.g. in the Hohe Tauern National Park, or for virtual environments in medical education. The simulator at RWTH Aachen University was developed and built by IMTEC GmbH. VSimulation GmbH and Fraunhofer FOKUS were responsible for the projection technology.